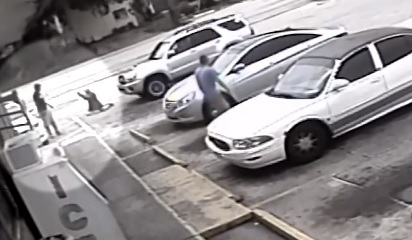 There was a recent shooting, which is being promoted as a"stand your ground" incident, in Florida. It has turned into one of those "big things" on the internet, with people picking sides. In some ways it seems like exactly the sort of thing anti-gun bigots warned would happen-- trigger-happy bullies looking for a fight (because they can and because they feel confident they can win)... and finding one. To others it seems a clear case of self-defense. Without more information I can't come down definitively on either side. The information it would take to make this clear-cut either way is unlikely to ever find its way to me. So, let me tell you what I see from both sides. Yes, it looks like the guy who got shot initiated force-- it seems clear he was the first to touch the other. But to me, it also looks like he was backing away and was no longer a threat when he was shot. "Stand your ground" wouldn't apply if that's the case. But maybe he was just staging for a charge. Or maybe he was de-escalating at the sight of the gun. I don't know. Without knowing what each person was saying it's not possible to know for certain what was going on. It is known that the shooter first approached and exchanged angry words with the soon-to-be-dead guy's girlfriend. (It is claimed that the shooter has a history of confrontations over handicap parking spaces, but who knows if this is true.) What did he say to the woman, and was he making a credible threat to initiate force? If so, then he's the one who started it, even if he wasn't the first to actually use physical force. You don't have to wait until someone takes a swing at you to rightfully defend yourself if he's telling you he's going to swing at you. How can you tell if a threat is credible or not? Some random blowhard on the internet saying he's going to come to your house and kill you, when he doesn't know where you live, is hundreds of miles away, and has no real way to carry through with what he's saying is not making a credible threat. Someone in your face screaming that he is going to beat you (or your friend) to a bloody pulp is making a credible threat. He is clearly saying he intends to initiate force, and due to his proximity, he is able to carry through immediately. You have the right to believe him and to use force against him in that case, even before he actually touches you. The Zero Archation Principle isn't a suicide pact. Now, since I wasn't there I don't really know all that went on. Parking in the handicap space was a loser move, not because of the state's permit system, but just for the human decency of healthy, capable people leaving the close spots for those who need them, blue paint or not. Getting bent out of shape because someone parked there without the "required" permit is also a loser move. After those two things, I can't have much sympathy for either combatant, even before admitting I think fighting over such trivial things as a parking space is always a loser move. "The video shows Jacobs stepping out of the car just as McGlockton rushes out of the store and then shoves Drejka to the ground. In response, Drejka pulls a gun out of his pocket. McGlockton appears to back off, and Drejka shoots him once. McGlockton later died at the hospital due to a gunshot wound to the chest, police said." I'd say based on that account, and in the absence of any video or audio evidence to the contrary, the person who was shoved to the ground and was on their knees should be presumed to be acting in self-defense. From the Libertopia view, would you feel comfortable personally throwing the defendant in a cage and locking them up for years if that was all the evidence you had? I sure wouldn't. And if I wouldn't personally do it, I certainly wouldn't want that power delegated to someone in "authority". I'd say for once the state did what it ought to do at all times: nothing. Well, I don't believe in imprisonment, so it's a non-issue to me. And I agree, nothing is always the best thing the state can do, even in cases where someone else should do something. Based on how the shooter acted before the shooting, I would shun him. Based on the woman parking where she did, I would shun her, too. If she wants restitution from the shooter I would support her right to seek arbitration. I wouldn't arbitrate her case because I am shunning both of them.